PE: How did you get sucked into the Thriller vortex? LR: I first encountered Thriller on Tuesday, April 18, 1961, when my late brother and I stumbled across "The Devil's Ticket"; what an introduction to the series, which was just entering its "golden period"! We were rather sheltered in my home; during all of 1960, our parents had regularly bought us fantasy/sci-fi comics (the watered-down Comics Code stuff), granting us their somewhat-grudging approval to "lose ourselves" in the fantasy genre. We had also got a late start on Twilight Zone, which we first discovered in January, 1960. That meant that I saw the network premiere of "Long Live Walter Jameson", TZ's major horror offering that year; scared the crap out of me (a tender, impressionable 9-year old at the time). In the fall of '60 we caught both TZ's "Howling Man" and "Eye of the Beholder", both of which excited and frightened us. But that was about it, since there was very little on TV at the time that resembled real horror programming; true, you could catch theatrical horror films that had been sold to TV, but most of it aired at night (permission was rarely granted for us to stay up and watch), and those which ran in the late afternoon were often heavily edited. Our family went out to the movies fairly often, but we were generally "shielded" from the really scary, grotesque stuff. JS: Tell us what it was like to discover the show when it was new. 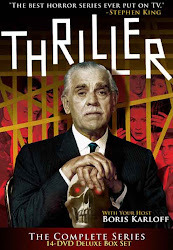 LR: Discovering Thriller was indeed thrilling—here was a show that a) often featured truly horrific content and b) was presented in a legitimate, prime-time viewing slot on a major network! It immediately became standard viewing in our home. I clearly remember watching "Pigeons from Hell" with my mother and brother in the kitchen on June 6, '61; luckily it was a nice sunny evening outside, and still light enough to offer some sense of protection from what we saw on the screen. We had seen the promo the week before, which had ended with the shot of David Whorf walking out of the dark with his head split open; ("Hey—looks like a good one next week!)" I still remember the almost unbearable tension as Brandon deWilde makes his final ascent up the staircase near the end—holy crap, what a scene! Next week, it was the "Grim Reaper", and the week after, the summer rerun of "The Purple Room". What was amazing was how, within a few weeks' time, Thriller managed to build up our resistance to this sort of barely-tolerable terror. It was a unique experience and, after 50 years, I am stunned to find that the best episodes of the series still have that unique "something" that bores deep into the human psyche, quite unlike most anything else that I've seen. LR: I have no single favorite episode; I have five that all share a hallowed place in my humble opinion: "Pigeons from Hell," "Grim Reaper," "Waxworks," "The Weird Tailor," and "The Devil's Ticket". Interesting that four are Bloch stories and three were directed by Herschel Daugherty. LR: The aspect of the show that turns me on is somewhat complex; it is deeply rooted in the time during which the show was created and aired—the "way the world was"—and the fact that those of us who were alive and aware of things in 1960 have a perspective on the show that youse' younger dudes could never have. The whole feeling of the 1950's, so closely tied to the immediate post-war period, was vastly different than the cultural millieu of the past 40 years. 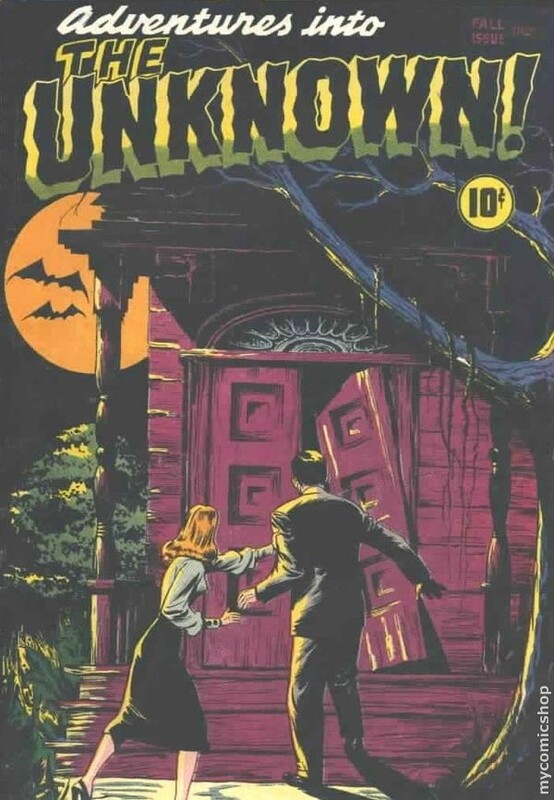 This was the era when horror pulps were still around but, perhaps more importantly for young people, the pre-code horror comics of the 50's, which had definitely embodied the spirit of these simpler, more "primal" times, and were still fresh in the public's mind. 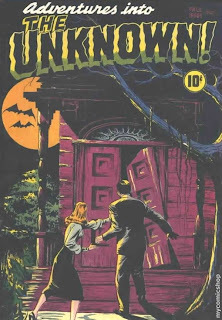 Check the cover of the 1948 Issue #1 of the ACG comic Adventures into the Unknown; to me, that's exactly the feel of that spooky, exciting, 1950's Halloween-type zeitgeist that I experienced as a kid (and which Thriller captured beautifully). 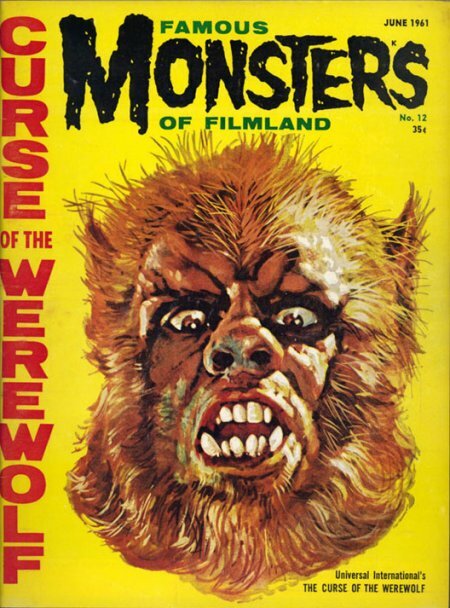 Also, the "Classic Monster Craze" was in full swing in the late '50's; Universal had released its seminal monster films to TV for late-night, local "Shock Theater" showings, Hammer Films was producing its new horror series for the theaters, William Castle was doing his nutty thing, and Famous Monsters of Filmland was flying off the magazine racks; these were the simple but deliriously delightful, horrific pleasures of the era. 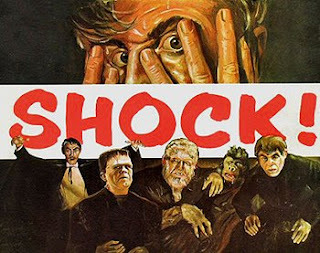 Then Hitchock's Psycho exploded on the scene in 1960 ; keep in mind it was made at Universal, in black and white, with a creepy haunted house, string-only score, Saul Bass titles with jagged lines that disappear at the end of the credits, etc, etc... it had a profound effect on the public and its capacity to endure screen horror. In the fall of '59, The Untouchables debuted on tv and ignited a firestorm of controversy over its sensationalism, violence, cruelty, darkness, etc... thus really pushing the envelope for network tv as the 1960's dawned. Thriller was an outgrowth of all of these powerful influences; it's not only the incredible atmosphere and feel of the best Thrillers which is so great (anyone, no matter what age, can appreciate that), but the unique way in which it captures and embodies the "spirit of the times" in which it was created—and to experience that, you had to be alive and functioning back then. The other great thing about the series is the incredible array of talent that worked on the show, both in front of and behind the camera: that once-in-a-lifetime stable of great character actors, most of whom had come from the New York stage, and the design and camera folks, most of whom had worked in the major studios and could produce amazingly good quality on a tiny budget in an impossibly short time span; true pros, all of them, whose work will hopefully endure. LR: A loop of Mort Sahl endlessly repeating "Get in the World, will ya?" (looking straight into the camera.... in such an extreme close up that you could count his nose-hairs). Larry, you've certainly nailed what it was like to be an early '60s "monster boomer" (a noted film historian came up with that ideal term--Tom Weaver, maybe? Bill Warren? Help me out, DJS!). We mustn't forget Aurora's classic model kits and those 8mm Castle Films, which unleashed Universal's '50s sci-fiers a few years before they hit TV syndication. Prime-time THRILLER -- featuring Boris Karloff, no less! -- was clearly a part of this Hollywood retro-monster "movement," which finally culminated in self-parody with THE MUNSTERS (1964). But for awhile, a few years at least, we m-boomers were the coolest kids on the block, with the niftiest collections... even if we couldn't afford that "impossible" $34.95 for a magnificent Don Post mask!